My research interests in stream ecology include energy flow and nutrient dynamics, periphyton, macroinvertebrate and fish ecology, and aquatic restoration ecology. Research projects include large river restoration in the Pacific Northwest where I examined the role of dam-induced nutrient limitation on food web dynamics of white sturgeon, as well as the role of floodplain connectivity on juvenile pacific salmon survival. Over the last 14 years I have worked in Michigan and have conducted grant-funded research to look at the relative success of road-stream crossing improvements and dam removal on substrate, channel form, primary production, and macroinvertebrate and fish community structure and function. 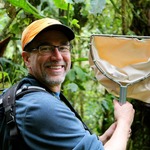 Additional research projects have involved stream food web analyses in Ecuador, Alaska and Michigan using stable isotopes, habitat selection of rainbow trout in Idaho, river water quality in Ecuadorian cloud forest streams, and nutrient limitation using artificial nutrient diffusing substrata above and below fringing floodplain wetlands. I have collaborated with and mentored 17 graduate students and 25 undergraduate students on independent grant funded research projects. I received a BS degree in Biology and Chemistry from Manchester College, Indiana, a MS degree in Aquatic Sciences from Central Michigan University in 1996, and a PhD in Zoology from Idaho State University in 2001. I completed post-doctoral research with the University of Montana’s Flathead Lake Biological Station in 2002 and have been serving as a Professor in the Biology Department at Grand Valley State University since this time conducting and publishing research and teaching classes in aquatic science, stream ecology, aquatic ecosystem management and evolutionary biology.